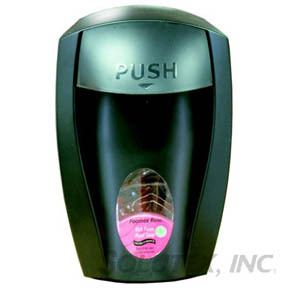 FOAMEX SOAP DISPENSER BLACK - SOLUTEX, INC.
Dispensers for Foamex hand soaps. Clean contemporary lines, leakproof push-pad placement and luxurious foam soap make the Foamex Dispensing system the solution for every hand soap need. Dispenses .75 mL of rich foam per push vs. 1.5 mL for most bag-in-box dispensers. Dispenser have a keyed locking option and measure 6"W x 7"D x 10"H.